“There are many Jewish immigrants who came to this country decades ago, even centuries ago, buried there," an Anti-Defamation league official in New England said. 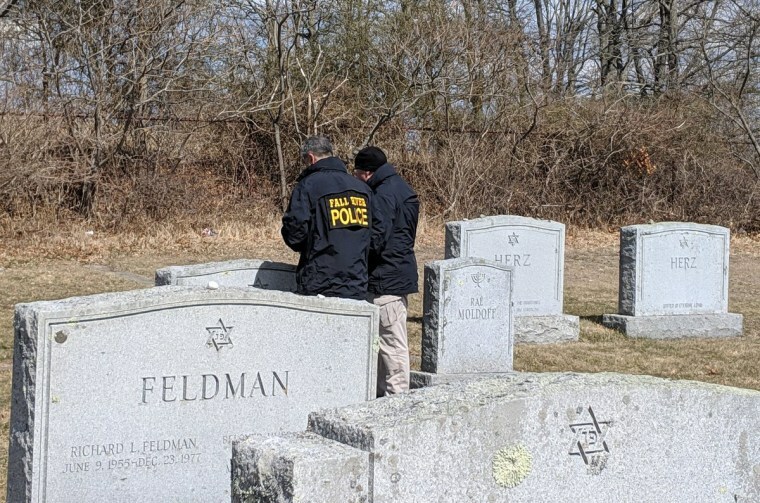 Authorities are investigating a possible hate crime after dozens of graves were vandalized at a Jewish cemetery in Fall River, Massachusetts. Police found more than 20 gravestones defaced at the Hebrew Cemetery with swastikas and other anti-Semitic graffiti on Sunday. Authorities made the discovery after responding to call from a resident who lives close to the cemetery, according to a statement on the department’s Facebook page. Some of the gravestones had also been pushed over. "Desecration of a religious or holy place, it's just something that’s not acceptable," Fall River resident Lewis Brooks told NBC Boston after finding several of his relative’s graves vandalized. “There are many Jewish immigrants who came to this country decades ago even centuries ago buried there," Robert Trestan, regional director of the New England region of the Anti-Defamation League, told NBC News. “It’s scary because - we know - history has taught us what happens when hate goes unchecked. So, we have a responsibility now to stand up and put a stop to it," Trestan added. The incident has also disturbed some residents in the area who are wary that anti-Semitic acts are becoming more prevalent in the United States. "It just seems to be getting worse and there’s a lot better things that I think people could do with their lives than desecrate other people’s rights to religion," local resident Carl Superior told NBC Boston. Superior has family buried at the cemetery, but their graves were not disturbed. This incident comes during a time when anti-Semitic incidents in the U.S. have spiked. In October 2018, 11 people were killed in a shooting at a synagogue in Pittsburgh. The following month, a Jewish professor at Columbia University found large swastikas spray-painted on the walls of her office. Hate crimes in general have been on the rise the past three years with a 17 percent increase in 2017, a FBI report shows. The Anti-Defamation League is offering a $1,500 reward, in addition to a reward from the police department, to anyone that provides information that helps police capture the suspects in the Fall River incident.